Sacred Heart offers two ways to play! Sacred Heart students are provided with two ways to enjoy and learn music. They include our standard music class and an afternoon AIMA music program. All Sacred Heart Catholic School students have the opportunity to explore music and music theory. The school’s music education program promotes a range of music style and instruments. Students learn simple rhythm exercises and songs to instruments and singing harmony. 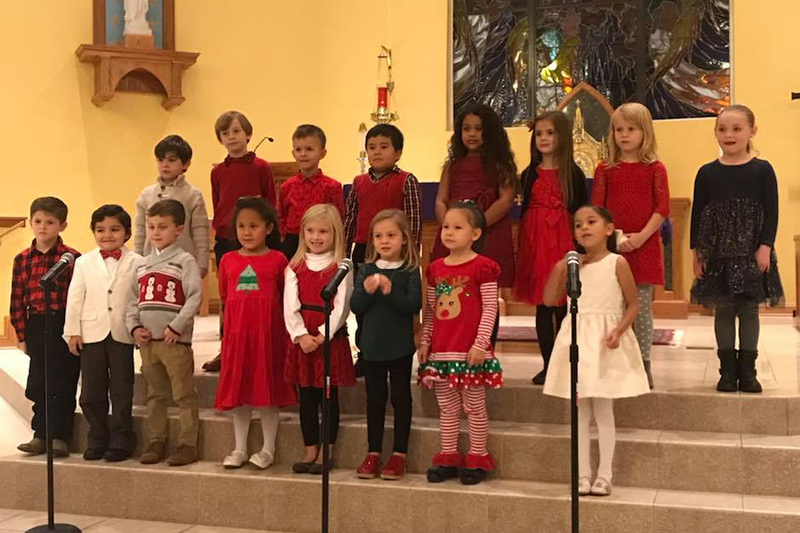 Students at all grade levels sing Solfege exercises, folk songs, and Sacred music. Dance is also used to help our youngest students “internalize” rhythm. Pitched percussion and hand-chimes are played in the upper elementary grades to prepare for playing music with the four octaves of handbells. Fourth Grade students learn to play the soprano recorder. Their course of study begins with three note melodies and progresses to music in two parts. Fifth Grade students study guitar. Starting with reading simple melodies, each student also learns simple chords. Each student has access to a guitar. The sixth-grade class studies fundamental music concepts on Yamaha electronic keyboards. All middle school students sing, play hand chimes and handbells, and explore musical styles, terminology, and history. Student talent is showcased throughout the year during Fine Arts Evenings. Students from Kindergarten to 8th Grade are invited to perform. An extracurricular music program is offered to students through the American Independent Music Association (AIMA). The association is the instructional music leader in the Eastern U.S. Participation is open to students in grades 2-8 regardless of background or experience. 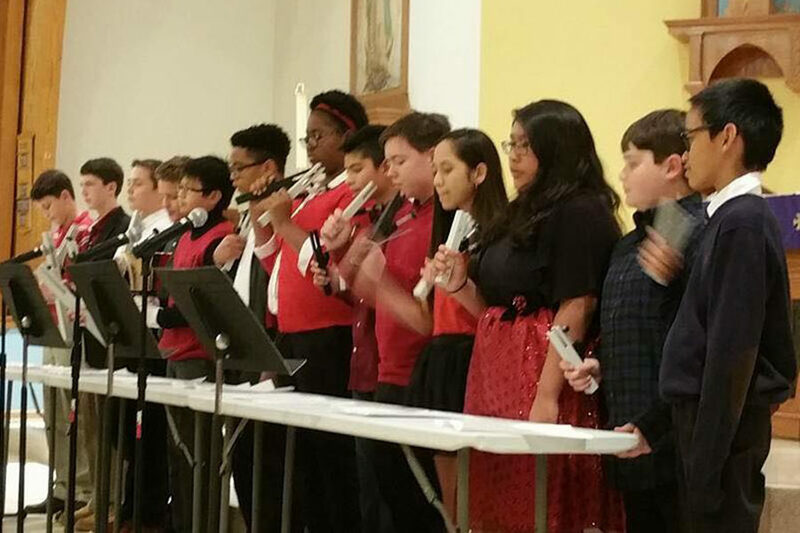 Students participating in Sacred Heart’s AIMA music program gain more than the ability to play a musical instrument. Music performance demands focus and self-discipline. It challenges fine and gross motor skills. It builds teamwork with other performers. It boosts self-esteem and personal responsibility. It brings peace and enjoyment. The AIMA Music Education program instructs simple rhythm exercises and songs to instruments and singing harmony. 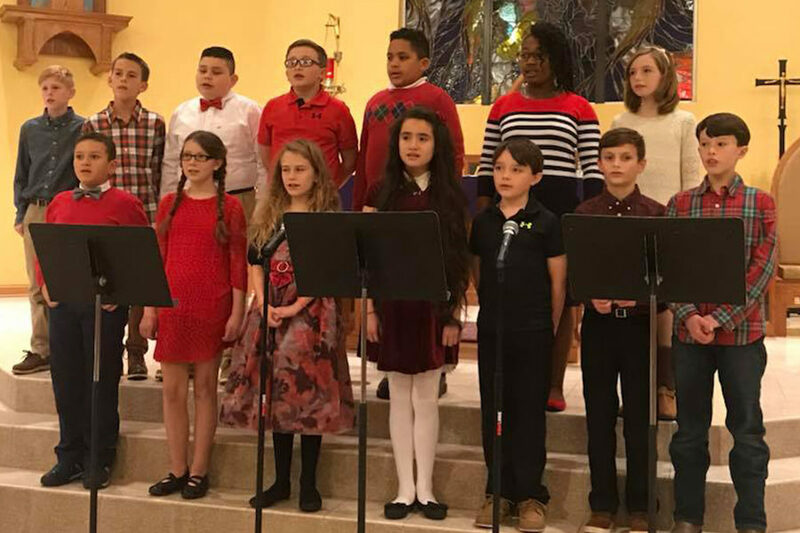 Students at all grade levels sing Solfege exercises, folk songs, and Sacred music. Dance is also used to help younger students internalize rhythm. Pitched percussion and hand-chimes are played in the upper elementary grades to prepare for playing music with the four octaves of handbells.Middle school students sing, play hand chimes and handbells, and explore musical styles, terminology, and history. Student talent is showcased throughout the year at our Fine Arts Evenings. Students in grades PK3 through 8th Grade sing and perform. AIMA also provides Sacred Heart students the opportunity to participate with other student musicians throughout the state in the AIMA District Music Festivals, Regional Solo/Ensemble Festivals and All-State Honors bands. AIMA offers several music programs to engage the range of student interest. They include instruction in band, keyboard, recorder, chorus and general music. Keyboard instruction begins in 2nd grade. 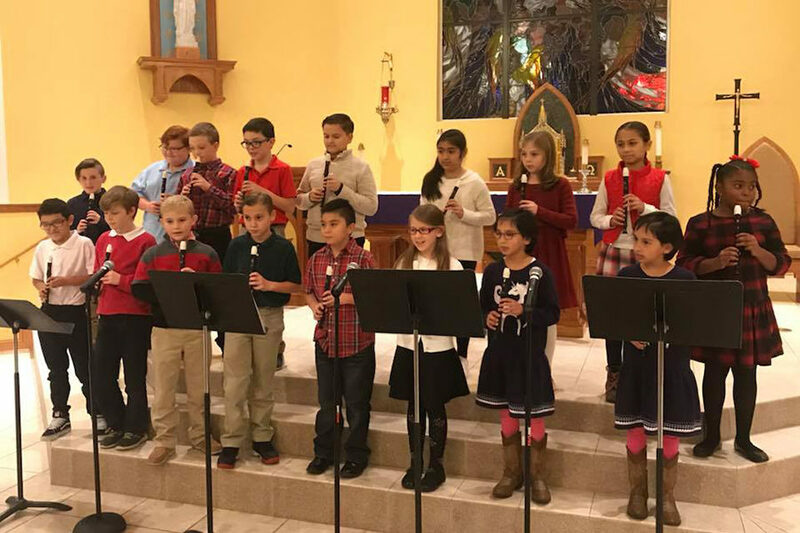 The recorder program is available in the 3rd grade. Band is offered to the 4th and higher grades. Support for the AIMA music program is funded by a modest fee from participating families. Affordable instrument rentals and purchases are also offered ($23 per month for most instruments). For more information view the AMIA website. Classes meet every Thursday after school in Room G. Private instruction is offered on Thursday afternoons.